Please don’t hit the back button as it may cause multiple charges to your card. Instead Of ‘Just’ Doubling Your Money Using Sense Drill, Would You Like To Quadruple Your Money Using The Exact SAME Traffic? WITHOUT the Case Studies Bonus! Force Them To Click On Your AdSense Ads! 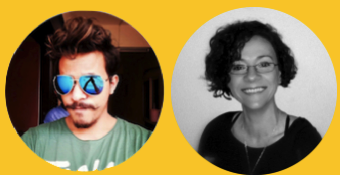 It’s very simple, let me explain…..
Hey, it’s Vaibhav here again, along with Ivana & Ram. As you’re already aware, Sense Drill is the easiest way to double your money (or more! ), by generating targeted traffic from Facebook at pennies per click, and then sending this traffic to a simple AdSense site. But, did you know…....most people will only click on an advert after they’ve been exposed to it 2-3 times? We live in a world where we’re bombarded with adverts and offers, online and off. In most cases, we train our eyes to become ‘blind’ to these adverts, and we ask our eyes to seek out only what is important to us, or familiar to us. Think about your own online behavior. Perhaps every so often there’s been an advert that’s been so compelling you just had to click on it straight away. But, I’m willing to bet, for the vast majority of times, you’ve clicked on an advert because you’ve thought ‘Gosh, I’ve been seeing this everywhere over the last few days, what’s it all about?’ And then you clicked on the ad, right? It’s the sense of ‘familiarity’ that nowadays gets people to stop and click on an advert. "Fortune is in the follow up"
Multiple exposures to an ad is proven to seriously increase conversions – you can expect up to 4X the normal conversion rate. 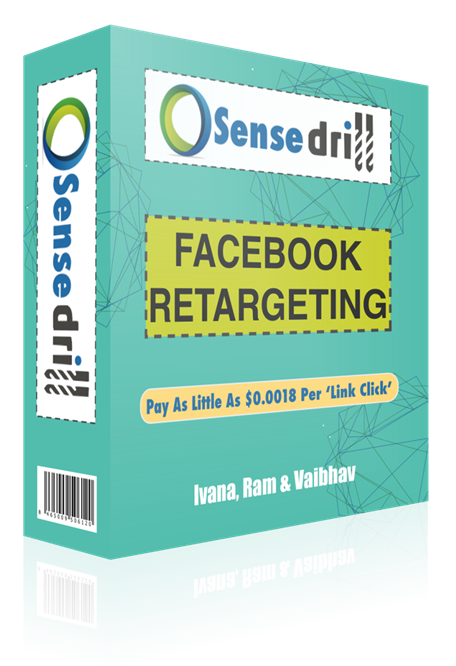 Sense Drill shows you how to generate cheap traffic from Facebook, and send that traffic to an AdSense site which doubles your money. But think of how much MORE money you can make when I show you how to zoom in on all the people who visited your AdSense site (but didn’t click on any of your AdSense ads) and expose them to your ads again so they do. It costs 4 times less to remarket to someone who has previously seen your ad than it does to show the ad to a new person. AND, that person is more likely to click on your advert because, as I explained above, most people need to feel familiarity before they click on an advert. Why go through the effort, time and money targeting new audiences all the time when you can make more $$$$ from retargeting the SAME audience? I can save you all that time, effort and money, and show you EXACTLY how I retarget an audience on Facebook, bring them back to my AdSense site, expose them to my ads again, and practically force them to click. and with the same traffic…….right here! I’ll show you how to target everyone who landed on your AdSense site, but then didn’t click on any of your AdSense adverts. I’ll show you how to bring these people back to your AdSense site, and get them to click on your AdSense ads so you get paid by Google. The brilliant thing about remarketing on Facebook is that each click costs around a quarter of what it costs to target a new audience. Instead of just doubling your money through AdSense, I’ll show you how to quadruple your money! Listen Closely: This upgrade is NOT essential – Sense Drill alone will show you how to double you money within 24 hours, by sending dirt cheap traffic from Facebook to a simple AdSense site. hungry for 6 figure success in 2018. I am giving you the chance to take what you learn in Sense Drill, and put it on steroids, so you quadruple your investment…GUARANTEED.